Roberta is a great mid-30s musical, complete with confirmation (in the form of a title card at the very beginning) that it has passed the production code’s standards. Whereas in many 1935 films it’s blatantly obvious that the code took out a lot of the film’s wit, Roberta doesn’t suffer at all. In fact, it’s one of the best musicals I’ve seen, despite the few lyrical changes that were forced on it. This film has a lot going for it, starting with an extremely witty script. It’s adapted from a Broadway production and definitely feels very Broadway. Though I haven’t seen the stage version, I think it’s safe to say that no charm was lost in the process of adapting the story for film. One of the most charming elements of the script is the dialogue, which is perfectly delivered by the film’s cast. Quips are tossed from character to character, creating a fun banter that makes the characters both highly lovable and believable. The cast not only delivers their witty lines perfectly, but shines in general. Ginger Rogers is the real stand-out here, giving the best performance that I’ve ever seen from her. She and Fred Astaire are completely captivating and scene-stealing. They play off of each other so well, and this film makes it very easy to see why they’re still remembered as one of the greatest on-screen pairs. Oddly enough, this is also where my only complaint of the film comes in. Rogers, Astaire, Irene Dunne and Randolph Scott are all undeniably wonderful performers and do not fall short of those high reputations here. However, because Rogers and Astaire have such a high level of chemistry, Dunne and Scott fall to the background. 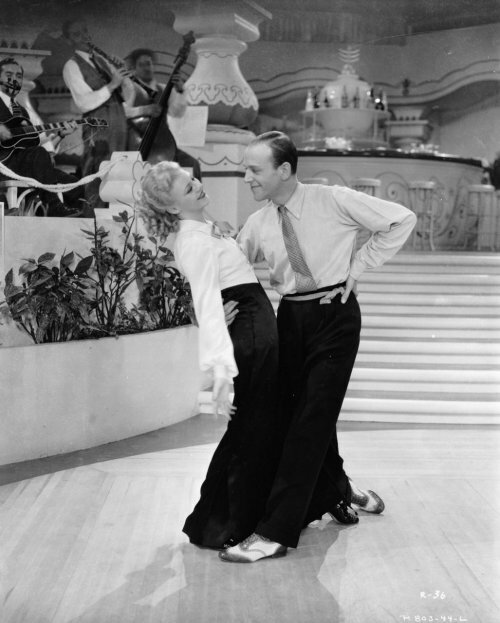 It’s hard for their characters to keep the audience’s attention while sharing the scene with Rogers and Astaire. Dunne, however, does get to show off her delightful operatic vocals. She and Scott do their fair amount of shining — as long as Astaire and Rogers aren’t present in the scene. Roberta is fashionable, elegant and so much fun to watch.